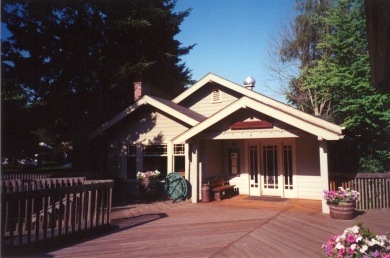 This was the permanent family home built by Albert Anderson, a native of Issaquah. The exact date of construction is not clear, but it was probably completed in the late 1920’s. The house has architecturally the same exterior, with its notable three-peaked roof, as when it was moved from its former location (across from the Darigold Dairy) on Front Street in 1972. It has been decorated inside with wall paper and furniture representing the period of construction.